In the Old Testament research say there has - to put it mildly - not been agreement concerning Moses. Although he is the unquestionable main character of the Bible's "Books of Moses", anyway the differences begin when the discussion is directed to whether he was a historical person or not; and in the past 100 years it has featured virtually every opportunity, from a purely fictitious person, an invented ancestor, to various attempts to link him with a desert priesthood on the Sinai Peninsula. But this is hardly an exaggeration to say that the historical Moses has been shrouded in the mists of the myths and legends. There is something both impressive and terrifying about Ove von Spaeth's attempt to rediscover the historical Moses. I have not read the first volume of von Spaeth's major work, announced in the many volumes. But the current second volume - on assassinating Moses - is incentive reading. Von Spaeth is an immensely learned person - obviously at ease in the difficult disciplines of Egyptology - he deciphers inscriptions, sculptures, calendars, historical records and much more with a brilliant breadth of view; and the result can be said to be nothing less than striking. Von Spaeth's opinion is of making it clear that Moses was an Egyptian prince, thus actually the son of Pharaoh's Daughter, and as such is designated to be Pharaoh. His mother was Queen Hatshepsut who gave him birth in February 1534 BC She is remarkable by managing to crown herself to be Pharaoh. Von Spaeth sees this as an attempt to ensure her son's candidacy for the pharaoh title. The person Jethro who in the Bible is Moses' father-in-law, was, according to von Spaeth a senior member of the royal family and bearing the river-god title Iteru - i.e. here biblical Jethro. But Moses had a half-brother whom his (step)father, Pharaoh Tuthmosis II, had with a hareem woman. He got Moses outmanoeuvred to make himself ruling, later under the name of Tuthmosis III. However, Hatshepsut's son is not known under the name of Moses; he is also named Senmut and seems to have been something of a polymath. Very early he achieves the high-level positions as a royal deputy and minister of finances and taxes. But he is also a brilliant architect and army general - all of which von Spaeth has documented from investigations inside grandiose tomb constructions which Senmut had made both for his mother (the queen) and for himself. Von Spaeth presents what it could determine the existence of a special ritual for royal infants, which just makes the prince come floating on the river, then to be placed in the care of a wet nurse. And we have actually found Senmut's/Moses' nurse as a mummy in 1936! Husband and wife were buried as royal foster parents. In his own tomb a star map is found, it is unique in its specification of the celestial bodies' arrangement, which confirms the date, the date on which Moses was born, according to Rabbinic traditions. Now, von Spaeth presents an extensive series of specific parallels between Senmut and Moses, which will indicate that it could be one and the same person. The most conspicuous is that they disappear from Egyptian history at the same time. What happened? The priesthood established a plot, and they found a willing tool in the later Tuthmosis III who just seems to have been a priest before he makes his entre to the historical arena. First, Moses' nurse is eradicated; and then the situation also hits Moses. According to the Bible, Moses had to flee because of the death of an Egyptian slave master. It was an arranged trap, according to von Spaeth, as there was death penalty for attacking pharaoh's herald. Perhaps the killing was fictitious; and so was the ritual execution of Moses, too. Von Spaeth connects all of this with the rituals which also deal with "the king's renewal magic by a substitute victim". Moses was, thus, substitute-sacrificed so that the king - the new Tuthmosis III - could appear with renewed vigour. Von Spaeth goes further linking it with the ritual fratricide with lines of connection both to the Cain-Abel and Osiris-Seth. Senmut/Moses is then fleeing - but not as in the part known from the Bible directly to the north. Not at first anyway. 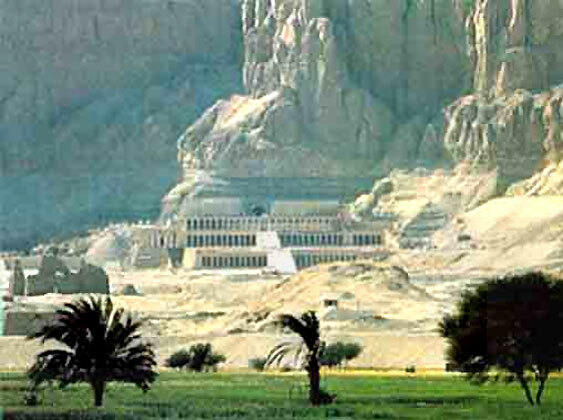 He seeks the south where he performs other heroic deeds, but Tuthmosis looking for him in the north. And then the iconoclastic riot takes place: Statues crushed, inscriptions cut out and changing the texts, thus Tuthmosis replaces Senmut. Von Spaeth's achievements are impressive - and to a great extent convincing. The production is exciting as a crime story; and it is also a crime to be discovered. When I have to declare certain scepticism, then it's not because of the account and presentation but the book's appendix which exposes some rather rambling theories on Jesus' death. Von Spaeth suggests that Jesus did not die not "for real". He quotes the Quran (! ): "They either killed or crucified him, but it only seemed as such". Again, von Spaeth finds ritual and fratricide in the relationship Barabbas-Jesus. But here we are on more safe historical ground. And I can not help but ask: Are von Spaeth's theories of Moses - despite the thorough documentation - just as discursively speculative? Will I be convinced only because I do not know much about the subject in this lighting? But let it be! this book definitely thrilling and worth reading; and makes you look forward to the sequel. But what have our universities' Moses-experts to say about it? The Danish writer and explorer, Ove von Spaeth, has published his explorations in five volumes about Moses. This book-series, titled "Assassinating Moses", presents well-documented information which reverses our traditional conception of Moses and his life. Moses, was he an Egyptian and therefore not a Jew? - Indeed, who was Moses really? Ove von Spaeth's extremely systematic and detailed research discloses that the lives of Moses and Senmut, the Egyptian chief-architect, are surprisingly identical. The amount of identical events is simply overwhelming. Indications concerning identity questions are supported by Ove von Spaeth's books with their comprehensive collection of exact source exemplifications and actually parallel facts about the status, the positions, and the works of Senmut and Moses. The potential of this intelligent, creative, innovative initiator, Senmut, who was closely associated with the royal family, is in so many ways identical to many specific areas exactly according to what the Rabbinical Writings and other ancient sources inform about Moses' varied talents and actions; and thus - also according to the Bible - he had the title, "The Son of Pharaoh's Daughter". To see the connection between Senmut and Moses requires of course a starting point in respect of the natural scientific objective ideal as far as eliminating preconceived ideas are concerned, so that research can be done with a new view on the displaced sources also. Normally, the biblical research has so far been carried out as if Moses is only known in the biblical version. Thus hitherto in the research of this lines by and large all Egyptian, Greek, Roman, Indian, and Arab traditions, and the records of the oldest Church fathers, have mostly been restrained as disturbing elements. Ove von Spaeth's book-series is a genuinly good foundation for the teaching about Moses. Ove von Spaeth: "The Enigma of the Son of the Pharaoh's Daughter: - Moses' Identity and Mystery Reviewed", - C.A. Reitzel publishers, 2000 - 239 pages - "Assassinating Moses", 2. This second book on Moses and the historical material develops his Egyptian context in greater detail and outlines his early career with events preceding the Exodus. Ove von Spaeth's method consists of bringing together ancient Hebrew texts, such as the ancient Rabbinical Writings and existing Egyptian inscriptions and manuscripts and comparing their accounts for cross-references with regard to specific events in Egyptian history. From these, as well as from astronomical records, the author suggests that Moses was probably born to Queen Hatshepsut 3,500 years ago, and rose to power as a high-ranking leader among the Egyptian elite. He was ousted in a coup, along with his mother, and records of his existence were systematically erased. A significant portion of the book consists of presenting a series of close parallels between the rise and fall of Queen Hatshepsut’s chief consul, Senmut (Senenmut) - whose astronomical representation of the skies is the oldest known Egyptian star-map - and the figure of Moses. Anu Kumar, Ph.D. in English Literature, Pittsburgh University; M.A. in Sanskrit Studies, Copenhagen University; Associate Professor in Hindi, Aarhus University, - (9.Oct.2011). C.A. Reitzel Publishers, Copenhagen 2000, 239 pages, illstr., DKK 248.